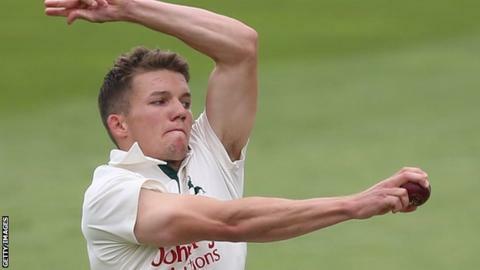 Kent have signed Nottinghamshire seamer Matt Milnes on a three-year deal. The 24-year-old made his debut for his hometown club against Somerset in June and has taken 14 first-class wickets. Milnes told the club website: "I'm grateful for the opportunity Notts have given me and I've loved every second of being involved with my childhood club. "I appreciate all the help I've been given to improve my game but feel the time is right to move on and I'm looking forward to getting going here."